Explore the hottest software utility categories, check the latest editions of the popular applications, and acquire free! The best solutions for computer and cell appliances. Tools, free programs, apps, and trial programs, combined into certain sections are at the solution. Program downloads from our catalogue deliver you beneficial tools and apps for the PC or mobile devices. In general software solutions are free, so you be able not only improve your PC with new utilities, but also save time! Best PC utility software, free to download and easy to use. Download now! System software for development, management, and support of your computer greatest patterns. Hard drives utility diagnostic tools to test the physical media. Utility software for Mac reviews champions! Get the most from your Mac with SoftEmpire! 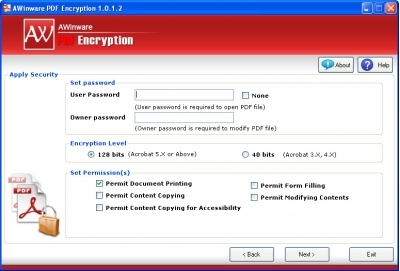 Batch PDF password protection software, set pdf open and owner password, RC4 40 bit and 128 bit encryption, set various pdf permissions like allow/disallow pdf printing, text copying, editing, form filling, page extraction etc.